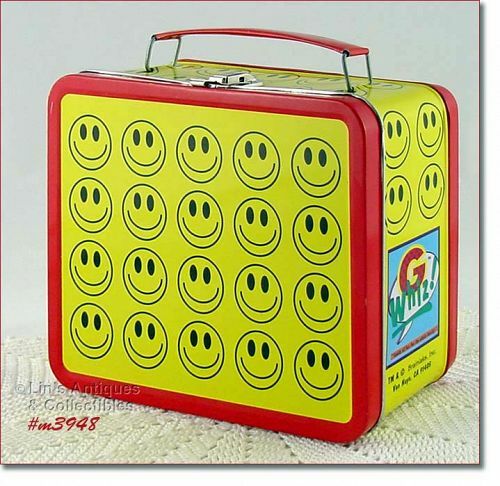 Very nice Smile Face lunch box! 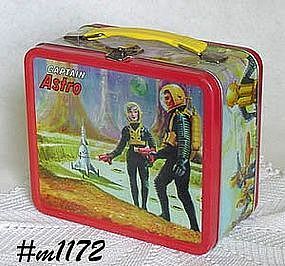 Although this is a metal lunchbox, it is a newer (not vintage) production. Side has: G Whiz! Loads of fun for the whole family!” TM & Brainiaks, Inc. Van Nuys, CA 91405. Lunchbox is in new, unused condition. It has a couple tiny flecks of missing red paint that probably occurred during storage. Cute item! 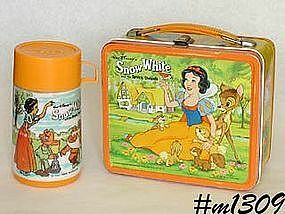 This is such a cute Aladdin lunch box! Made in 1975, it has a patch-quilt type look cute happy dog with flowers on a denim-look background. 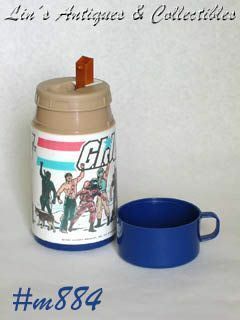 It has the original thermos but it’s missing the cup/top. Both pieces are in very good condition with very minor “use” evidence. 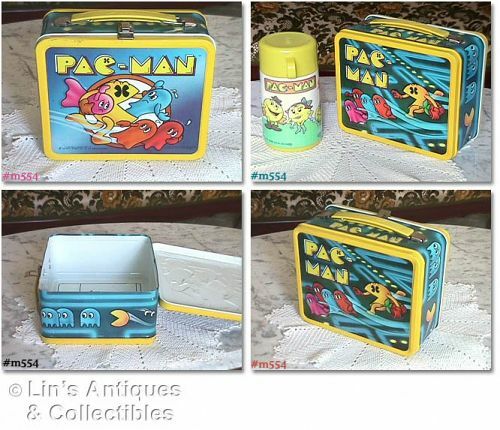 Neat lunch box that is not your everyday find! Made in 1968, this listing is for an Aladdin Industries brunch bag! Zippered bag is green vinyl with gold color bands at top and bottom. It is in excellent condition -- looks new! 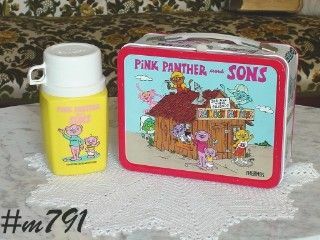 -- and it has a King-Seeley thermos and a small clear, covered snack container! 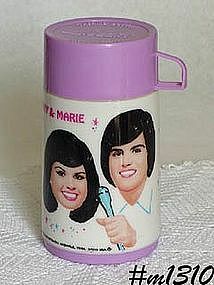 This brunch bag can be referenced in Larry Aikens "Guide to Vinyl and Plastic Lunchboxes" book. A stylish way to bring your lunch to work! Ready to use -- super items!! 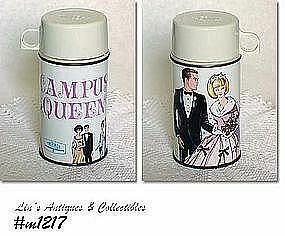 WHAT A FIND -- THIS IS THE "CAMPUS QUEEN" THERMOS! ARTWORK IS EXCELLENT, JAR IS EXCELLENT -- HAS VERY MINOR RUST ON BOTTOM -- THAT'S IT! BOTTOM EDGE HAS: BOTTLE NO. 2801, 1967 KING-SEELEY THERMOS CO." SUPER ITEM! 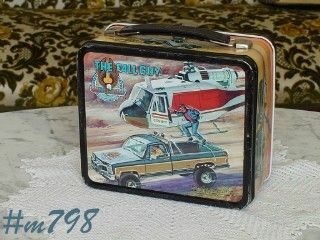 REALLY NICE LUNCH BOX PRODUCED BY G WHIZ COMPANY OF VAN NUYS, CALIFORNIA. THIS IS A SUPER "NEW" ISSUE THAT LOOKS LIKE THE ORIGINAL -- THE COLORS ARE GREAT AS IS THE ARTWORK. LUNCHBOX IS IN GREAT SHAPE -- HAS MINOR WEAR ON EDGES AND A FEW SCRATCHES. NEAT ITEM! 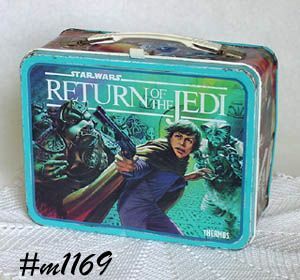 DIFFICULT TO FIND LUNCHBOX -- "STAR WARS, RETURN OF THE JEDI". 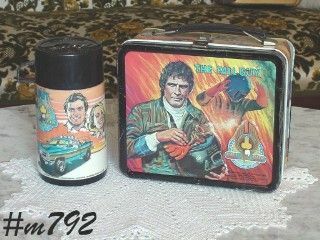 LUNCH BOX WAS MADE BY THERMOS COMPANY IN 1983. HAS BEEN USED -- HAS COLOR WEAR ON EDGES, HAS COUPLE SMALL DENTS, HAS A FEW RUST SPOTS, AND OWNER'S NAME HAS BEEN WRITTEN ON OUTSIDE OF BOX. STILL A NICE AND VERY COLORFUL LUNCHBOX! 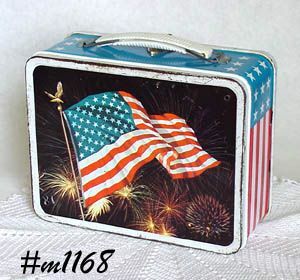 NICE FLAG LUNCHBOX BY OHIO ART! 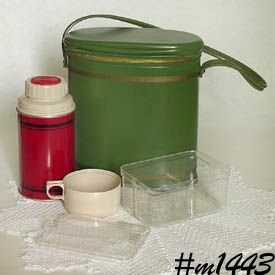 MADE IN 1970, LUNCHBOX IS VERY COLORFUL BUT HAS BEEN USED. THERE'S SOME DISCOLORATION ON THE "DAYTIME" SIDE, COLOR WEAR ON EDGES, AND THE "NIGHT TIME" SIDE HAD A HOLE IN UPPER CORNER AND LOWER CORNER (DIAGONAL). STILL A NICE COLLECTIBLE. VERY COLORFUL LUNCHBOX BY THERMOS! 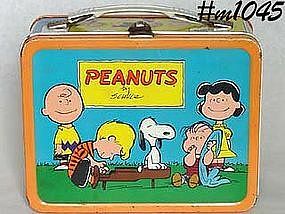 THIS ONE IS PEANUTS AND HAS OUTSTANDING ARTWORK WITH BRIGHT COLORS. LUNCH BOX HAS BEEN USED -- HAS COLOR WEAR TO ORANGE COLOR RIM, A COUPLE SMALL RUST PLACES ON INTERIOR AND ON CLOSURE. THE ARTWORK IS NOT AFFECTED. DOES NOT HAVE THERMOS. NICE ADDITION TO A COLLECTION OR FOR USE!